If you are dealing with losses resulting from Superstorm Sandy, please fill out this form the union is using to target support to members in need. A group of PSC members and staff have been trained to help with the FEMA registration process. Our statewide affiliate, NYSUT, has a Storm Relief Fund that you may qualify for, and the union has information about other programs that can help with repairs and rebuilding, financial losses, food assistance, counseling, etc. After the PSC receives your form submission, we will contact you with the relevant resources and information. The NYSUT Storm Relief Fund will provide small grants (typically $250-$500) to approved applicants, who have incurred (or will incur) certain storm-related losses that are not otherwise paid for by insurance or other reimbursements. Happy Thanksgiving from the PSC! 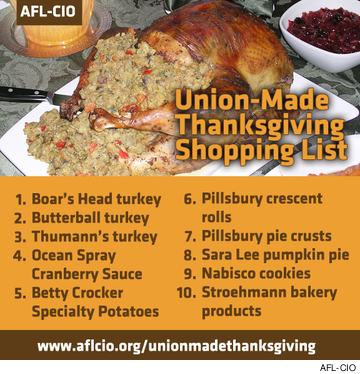 If you still have some shopping to do for a holiday meal, check out this link for a union-made thanksgiving shopping list, courtesy of Labor 411 and the AFL-CIO. In response to the impact of Superstorm Sandy on many of its employees, CUNY has announced a policy that will permit each college to set up an emergency Annual Leave Bank to which full-time salaried CUNY employees (both instructional and classified staff) who earn annual leave (not F/T teaching or counseling faculty) can donate up to 5 days of their accrued annual leave. The PSC fully supports the right of CUNY faculty to elect their department chairs, as established in the CUNY bylaws. When faculty vote to make a change in their department leadership, as happened recently with the English department at Queensborough Community College (QCC), the college president should accept the results of the vote and honor the wishes of the faculty. Diane Call, the president of QCC, has informed the English department on that campus that she will reject their near three-fourths majority vote to elect a new chair. Hundreds of CUNY faculty have signed a petition from the QCC English department faculty urging President Call to reconsider her decision to deny their vote for chair. Please add your name to the petition. 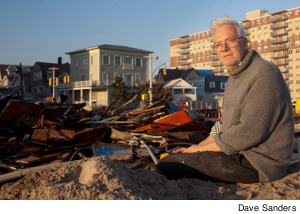 Eric Metcalf, York College, in front of debris in the Rockaways, where he lives. Looking out for one another is what being in a union is all about. Many of our brothers and sisters in the PSC have suffered significant loss and others were hit less hard, but still are in need of help. If you are dealing with losses resulting from Superstorm Sandy, please fill out this web form the union is using to target support to members in need. You can also call PSC's Sandy Relief Hotline at 646-459-6888. After the PSC receives your call or form submission, we will contact you with the relevant resources and information. PSC has members and staff people trained to help you register for FEMA assistance. Our statewide affiliate, NYSUT, has a Storm Relief Fund that PSC members can access for help. PSC's Environmental Health and Safety Committee is offering a workshop on mold and distributing respirators to help with clean up. And we've compiled links and information about other programs that can help with repairs and rebuilding, financial losses, food assistance, counseling, etc. President Barack Obama was re-elected to a second term in yesterday’s election, after winning important states like Ohio, Pennsylvania, New Hampshire and Virginia. He also won the popular vote by a small margin. PSC members phone banked union households to mobilize support for President Obama in New Hampshire. PSC-supported candidates also won seats in the US Senate, House of Representative and the New York State Senate. Do you know where your polling place is? Under normal circumstances, there is always some confusion about where to vote. But Hurricane Sandy compounded that problem many fold. For most of us, our polling place has not changed. But for tens of thousands more, it has been moved courtesy Hurricane Sandy. The New York state and city election boards claim that they are updating their data bases and websites. Read more for links and websites for voting in New York and New Jersey. The battle over Pathways is also being waged in this courts. Two PSC-UFS lawsuits are working their way through the court system. One argues that the CUNY administration exceeded its authority in matters of curriculum and failed to follow university bylaws and faculty governance procedures. The other contends that CUNY has advanced Pathways in violation of the State's Open Meetings Law. a chance to celebrate the union movements' victories and recommit ourselves to the ongoing struggle for workers’ rights. PSC members marched on Saturday for the millions of workers who do not have health insurance or pensions, for the workers here in our city who are fighting for livable wages and paid sick leave, and for the workers throughout the country whose very right to organize is in jeopardy.